Ask fellow campers about "Sun Valley Campground" and nearby attractions. We stayed just one night, on an early-October trip from the Midwest out to the Carolinas. The office staff (probably the owner) was friendly and helpful, but that's the only real positive thing I can say. The campground was mostly empty (very late season) and quite a few run-down seasonal residents were still hanging on. Quite a few of them were up at 6:00am to start up their old pickups and go off to work. There is a large -- several acre -- fishing pond in the middle of the campground, which was smelling pretty swampy. The camping fee was $27 for two adults. The total bill came to $40 -- water is $2, electric is $2, an A/C unit is $2, and so on. I'm not sure how she got to $40. Use of the picnic table was free. Beware, our GPS (Waze) guidance to the campground based on street address was incorrect, leading us to a site about a mile further West. We were just passing the driveway when we figured that out. We camped at Sun Valley Campground in a Fifth Wheel. Circumstances beyond our control caused us to need to find a place to stay at the last minute, and this campground was very accommodating. The owner was very friendly. The campground is beautiful and well maintained. There is a lake across the road. We got two pull through sites (we were two rv's traveling together) which had gravel pads and plenty of green grass between. I don't remember the exact rate we paid with a military discount but I believe it was close to $30. We camped at Sun Valley Campground in a Travel Trailer. This is a nice, quiet park. The staff was very accommodating with our unexpectedly late arrival. We stayed for just one night as we passed through the area, and appreciated the easy access pull-thru spot we were given. The park also has a great little playground for kids. We were traveling with our 6 & 8 year olds who both enjoyed the play equipment. Be mindful that this is a cash only park. We camped at Sun Valley Campground in a Travel Trailer. We chose Sun Valley for our 1st weekend camping trip in our "new-to-us" 40' Class A, towing a Jeep Wrangler Unlimited. We were extremely impressed with the site the owner gave us - a huge pull-through site. The campground is very clean and well-kept. Owners very nice. 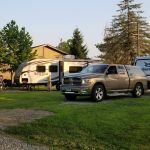 We really loved the site and the campground and would highly recommend it to anyone travelling through southern Ohio. We camped at Sun Valley Campground in a Motorhome. We live less than 50 miles form here and we focused on our motorhome and getting used to it. But for vacationers/travelers, there are some really nice attractions in the area that we would recommend - Old Mans Cave, Adena Mansion, Tecumseh Outdoor Drama, etc. Stayed one night. Only one pull thru which she reserved for us. Nice park but a little tight for a big rig, but we managed fine. Staff was very friendly and helpful. We will stay there again. We camped at Sun Valley Campground in a Motorhome. Just stay one night on the way home. We camped at Sun Valley Campground in a Travel Trailer. Well maintained RV park. Easy access on and off Highway 35. Very nice owners who keep this park well kept. We camped in a gravel pull-through. The park also has gravel and grass back-in. Great park - wish we could have stayed an extra night. We camped at Sun Valley Campground in a Motorhome. Nice park far enough off the interstate to not be too noisy. We were traveling through to West Virginia so it was an easy park to stay the night. Quiet. Well-kept. We camped at Sun Valley Campground in a Motorhome. Nice park on the west side of Chillicothe. Was a great place for a stop-over on our way to and from Illinois to Virginia. Watch for park sign on the right. We camped at Sun Valley Campground in a Motorhome. Good location to visit Hopewell Culture National Historic Site. My second time here...A must see...30, 50 and also one 100 amp drive thru site. This lovely place accepts no plastic form of payment. Cash or check only. Safe environment. Pet friendly park which requires pick up after your pets. We camped at Sun Valley Campground in a Motorhome. Good for family camping with lots of open space and pond for fishing. Most of the park is filled with full timers. The WiFi was not working on the night we stayed and management not savvy enough to fix it. No cable or DTV satellite coverage but the antenna TV was adequate. Sites were gravel/grass and site numbers hard to see. We camped at Sun Valley Campground in a Motorhome. Good for the kids with fishing pond and grassy play area. We arrived a little later in the afternoon so the other campers around us were already parked. It was a back in site so we had to work around bikes, cars, and the camper behind us to get in the site. We had to back in within about 2 feet of the camper behind us to reach the sewer hookup and water. Tough to park our truck in the site to get it out of the road. Not a really level site either. We had to use all our pads to get level. RV review says this campground has cable but it does not and only has a few OTA channels that you have to keep adjusting the antenna to view. The owner told us the wifi was down due to a lighting strike which should have warranted a little discount but was not offered. We probably would not stay here again. We camped at Sun Valley Campground in a Fifth Wheel. Hopewell Culture NHP was eye opening. This is an excellent short stay campground. We were here for a function in Chillicothe. Arrived after closing but we called ahead and the staff met us well after closing and guided us to our spot. Nice site, satellite worked well, and clean. The only caution would be to that if you are arriving at night approach slowly especially if you are in a big rig. We camped at Sun Valley Campground in a Motorhome. Had a pull thru site that was really 2 sites set up for 2 families. Lots of room. Pleasant park and quite pretty. We camped at Sun Valley Campground in a Fifth Wheel. This is a perfect one-night stopover. The park is clean and well managed with a friendly staff. The sites are level gravel. Hookups are at the back of the site so park accordingly. They accept cash or check. No credit cards. We stayed here last year on our trek to Custer SD and we will again. We camped at Sun Valley Campground in a Motorhome. Chillicothe (means "Principle City" in Shawnee) about 6 miles east. Old town has quaint, local eateries (try the Smoke House on Water Street), shops, and churches. The next exit (route 159) has Walmart, Lowes, Kroger (and Starbucks) groceries, fast food, gas and diesel at $2.359. The Hopewell Culture National Historical Park is 2 miles north on route 104 (western most Chillicothe exit), a National Park Service facility (no admission fee), a Native American "mound builder" historical site. Visit the Hopewell Culture National Historic Park. They also have Tecumseh Outdoor Historical Drama that looked good, but due to rain, I was not able to attend. Are you affiliated with Sun Valley Campground ?